Will you be the first frog to make it to the pond ? 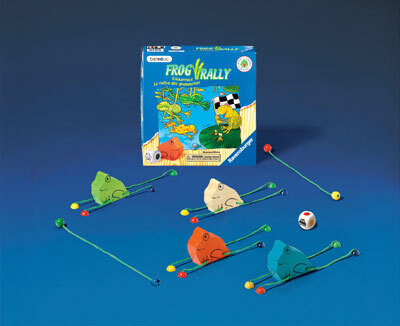 Roll the die to determine which frog leg you have to hold onto - and then pull the frog as far forward (for green or blue) or backward (for red or yellow) until the string is pulled tight. After each pull you will be in a new position in the race and must fix the frogÂ´s legs so that both front and back legs are the same length. Roll the frog symbol and you get a free move forward. But if you roll the car symbol, this means danger so you have to take a move back. The winner is the first player to reach the pond. What Do You Learn ? Color recognition, association, cause and effect.